Angry dads have paid a visit to the Barnes home of a high court judge and claim they will continue until "fathers have justice". 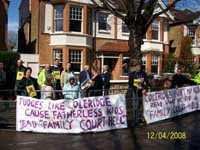 A protest was held by 35 members of Fathers 4 Justice (F4J) outside the home of Judge Paul Coleridge, in Melville Road, on Saturday, April 12, over his condemnation of the Government for failing to act over family breakdown and teenage deaths. Former Richmond resident and F4J member Mark Harris said: "It sticks in my throat to see this man passing the buck in this way because his family courts fail. "My case took 10 years of litigation, 133 court cases and £1million of taxpayers money wasted. If Coleridge and the previous 32 judges had done their job in the first place, none of this farce would have taken place." Leader of F4J Matt O'Connor spoke to Judge Coleridge over the phone. He allegedly refused to leave his house to meet protesters and complained that the demonstration was an inconvenience to his neighbours. However, he did agree to meet Mr O'Connor and a few other members in his court chambers to discuss the contact rights of fathers after divorce and separation. One F4J member, currently involved in a legal battle over his children, said: "We'll be back in far larger numbers next time if he doesn't listen, and he won't be given notice that we are coming."